Methods and devices for measurement of the disperse parameters of aerosols, suspensions, and powderlike materials included in the improved version of GET 163–2010 are described. A comparison of the metrological characteristics of GET 163–2010 before and after improvements have been introduced into the standard is presented. 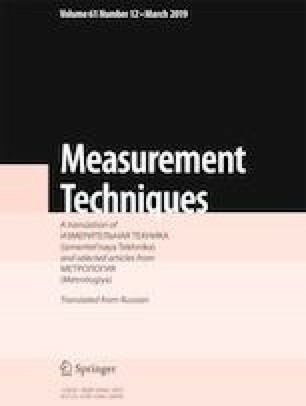 The problem of divergence of the results of measurements obtained by different methods implemented in the working measurement instruments from the results of methods achieved in standard devices is solved. Translated from Izmeritel’naya Tekhnika, No. 12, pp. 3–7, December, 2018.